Earlier this week, the new Honda Civic WTCC hit the track for its first proper test. Following a brief shakedown on 27 July at Vairano, near Milan, the Honda Racing Team JAS moved to the Autodromo di Vallelunga, near Rome, on Tuesday and Wednesday. Gabriele Tarquini was leading the two-day test session, while Tiago Monteiro attended and had the opportunity to complete a few laps. The Portuguese driver will be at the wheel of the car on its WTCC debut in the last three events of the current season at Suzuka, Shanghai and Macau. 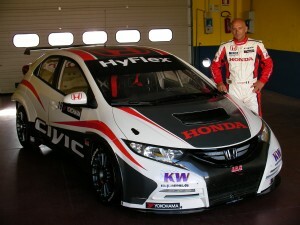 The test in Vallelunga was also the occasion for Honda to unveil the racing livery of the Civic. The new race car is the result of extensive wind-tunnel testing and the Civic WTCC sports a dynamic and stylish livery, which aims to accentuate its lines and imbues it with Honda’s motorsport and racing pedigree. The Honda Racing Team JAS have planned two more test sessions in Europe before shipping the car to Japan. A small army of engineers and technicians from Honda Motorsport Division, Honda R&D and Mugen Power flocked to Vallellunga for the Civic WTCC’s first test. “We have to congratulate HONDA RACING TEAM-JAS and the HONDA R&D engineers on the excellent presentation and performance of the new Civic WTCC car on its first proper test, carried out by top Touring Car driver Gabriele Tarquini. As Mr Alessandro Mariani has said, it’s a tough journey from here to the first race and then on to achieving the project goals, but we are proud that MUGEN will be playing an important rôle in this exciting journey, working with long-time friends and partners and helping to promote the technology and ideals that have made HONDA such a strong and well-respected brand worldwide. Competition is good for the soul, in this case the soul of the car-maker!’”.